Do you have scraps of paper with credit card numbers littering your desk? Are you spending more than a few minutes a day chasing clients to pay their bills? What if you could manage all your invoicing and payment collections within Tourbuzz? Well, you're in luck! We have an amazing feature that allows you to require payments before your clients can access your work, as well as an option to simply charge a card on file! We've partnered with Stripe so that you can securely collect and store your clients' credit card information, making it much easier to collect payments that are due to you. Below we've outlined just how easy it can be to collect your payments through Tourbuzz's payment collection feature. Don't have a Stripe account or not sure how to get one connected? Check out our support article on how to get started so you can stop chasing and start collecting! When you are ready to deliver to your client, click “Delivery Manager”. Select between a tour and photo delivery, or just the photos. In the top left of the deliver window, use the radio buttons to select either "Tour & Photos" for 15 credits, or "Photos Only" for 3 credits. 1. 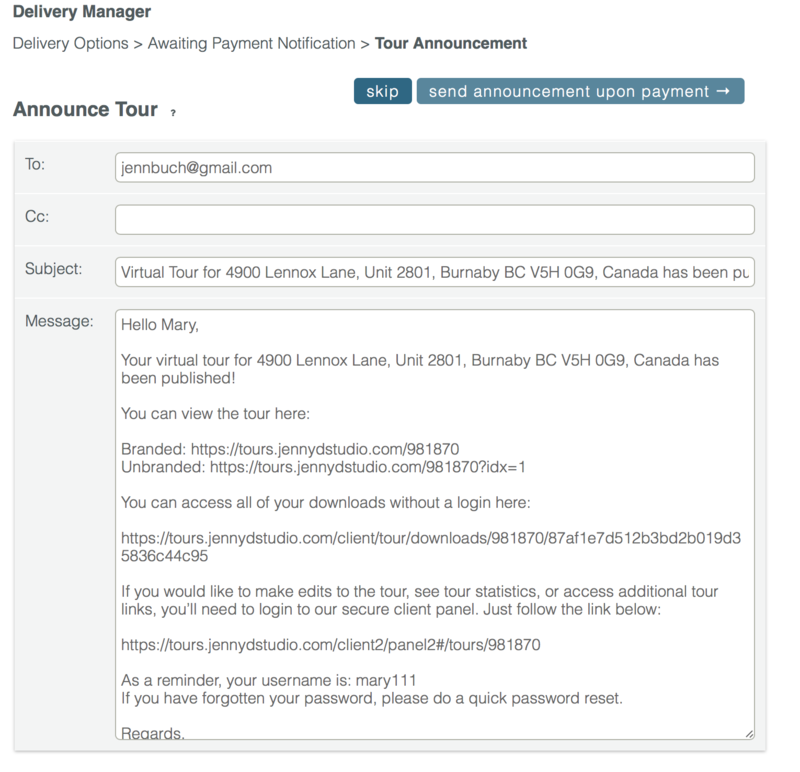 Require payment to release tour - selecting this option will open new fields, where you can enter the amount owed, along with a description of what is being delivered (Description is not required). This will send your client an email letting them know their items are ready but must be paid for before gaining access to them (**they will have preview thumbnails for each image, but will not be able to download them). 2. Charge card on file - if you already have a card on file (and if you've collected payment via Tourbuzz before for this client, there should be at least one option here), you can select Charge card on file, select one from the drop down, enter the amount and description, then click Deliver. Doing this will immediately charge the client's card and release the tour/images to them. Once you've made your selection, click Deliver in the bottom right. If you chose to " Charge card on file," great! You've already received payment and are ready to send the announcement to your client. Payment has been collected, your tour published, and your client notified! If you chose " require payment to release tour" the next screen will bring up an "Awaiting Payment Notification" email. Make any desired changes and select “Send Payment Notification” to send. The next email template to appear will be the tour announcement email*. Make any desired changes and select “Send Announcement Upon Payment” to send or "skip" to only send the “Awaiting Payment” email. *This will only be sent once your client has paid the outstanding balance for their tour and the tour is no longer awaiting payment. Once your customer pays, the tour/images will be released (no extra step needed on your end! ), and your client’s card will be securely stored on file so you may seamlessly charge them for future tours during the delivery process. If you've required payment to release the tour and/or photos, an Awaiting Payment Email was sent to your customer. However, we do understand that on occasion they may not receive the email or may have lost it. If that happens, we've added a way for you to resend that notification email to ensure they receive it and have the proper links to make that payment. To resend the email, click Edit next to the tour that is awaiting payment. 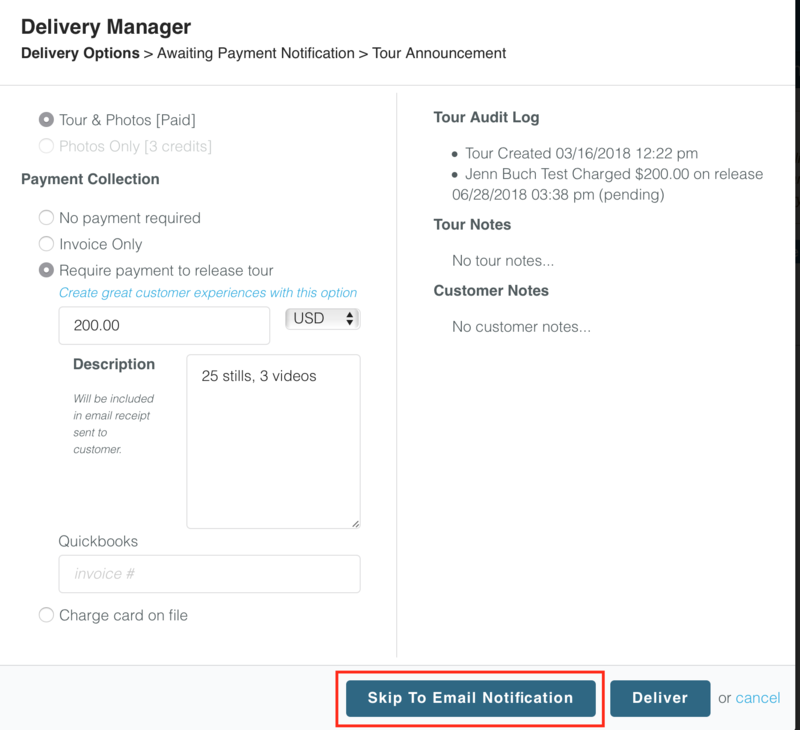 Within the Delivery Manager, make any changes necessary, or if nothing needs to be changed, click Skip to Email Notification. 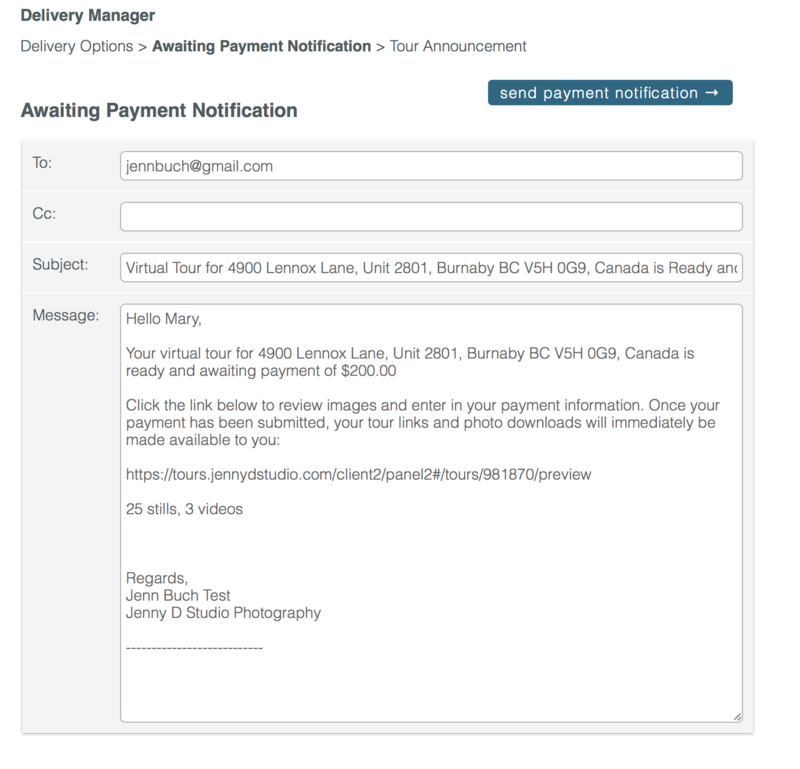 Clicking this will bring you back to the Awaiting Payment Notification email template where you can insert additional or new email addresses to ensure the notification is received. Once you've verified the email addresses are correct, click Send Payment Notification. If your client ends up sending you a payment outside of Tourbuzz, but the tour is in an "Awaiting Payment" state, do not worry! We have a "Release Now" option just for this scenario. 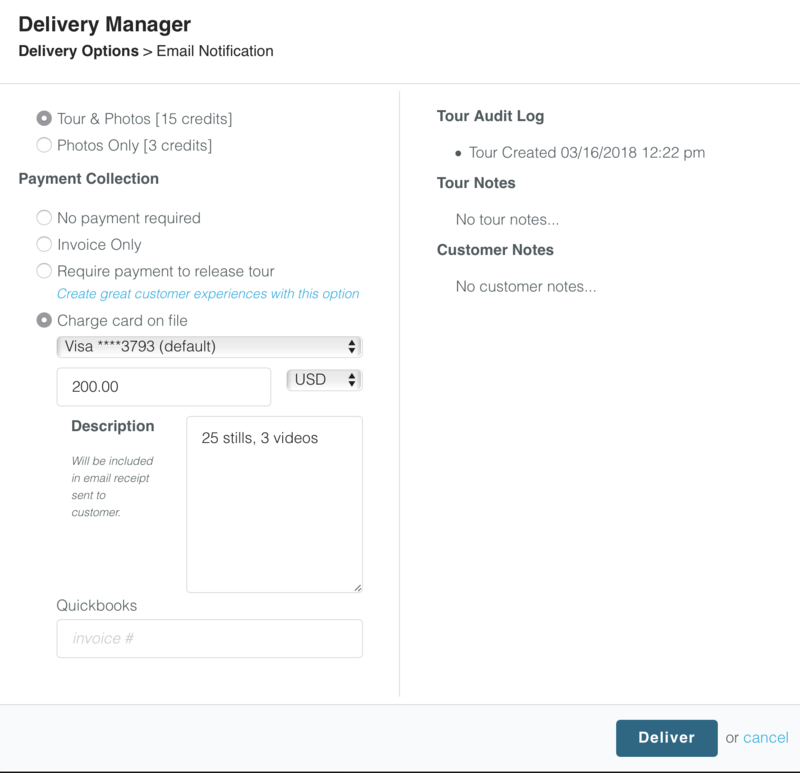 Within the Delivery Manager, change the Payment Collection to "no payment required" then click Release and Deliver. A confirmation will appear, confirming you wish to release the tour and cancel the required payment. If this is indeed what you need to do, click Release. Your tour has now been delivered, released to your client, and the announcement email has been sent. My tour is awaiting payment. In the meantime, can I export the tour to a video? When a tour is awaiting payment, it technically has not been delivered until that payment has been collected. Because it has not been delivered, the Export to Video feature is not yet available either. However, once the client has made their payment, and there is no outstanding balance for the tour, you will then be able to utilize that feature. If you find you run into this issue often, it may be beneficial to collect your customer's credit card information prior to delivery (a great way to do this is through our order forms) so that you can use the "Charge Card on file" option for future deliveries.